This week, we're featuring the Black Paris Profiles™ follow-up interview that Entrée to Black Paris intern and Fulbright Fellow Sonita Moss conducted with Almeta Speaks. Almeta Speaks is an artist and an academic, with both identities holding equal importance to her. Her music and scholarly pursuits have taken her around the world, from Canada to China to Mauritius and many countries in between. The unifying theme of her work is story-telling. It makes sense that Speaks is inclined to tell stories through her art; her surname is “Speaks.” The moniker can be traced back to a distant relative from the mid-nineteenth century named “Adelphia Speaks.” “Almeda” was her grandmother’s name and “Alice” is the middle name that she chose for herself. Raised in North Carolina as the oldest of eight children, Speaks made decisions about her fate from an early age, including her entrée into music. Speaks graduated from high school at 15 and moved to New York, working as a nanny for several years. She also “gigged” in the evenings, paying for voice lessons on the side. However, academia had taken root in her consciousness. Her twin passions for academia and art led to more performances, grants and awards to conduct research. She chose Paris as a locale to write a musical composition in 1997 with the support of an art grant. In 1999 she finished her Master’s thesis, a sociological study on the marginalization of black women’s contributions. She then enrolled in a doctoral program at the University of Toronto in the Higher Education program. Speaks’ passion for unearthing untold stories about Black women’s history is part of the trail she has blazed. 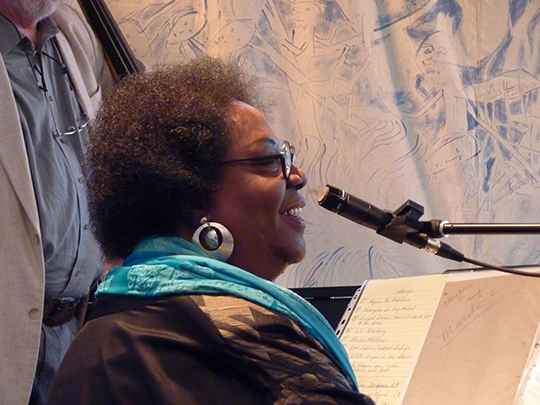 For years, she taught “The History of Black Music” at Ecole Polytechnique (Saclay campus) in Paris as a visiting professor. For her, scholarship and life experiences elucidated that gender inequality struggles are shaped by class and race. Mme Speaks has many stories left to tell. She is currently writing a memoir, which will detail her life and childhood, including oft-forgotten truths about life in the Jim Crow South. Although many imagine that the Civil Rights Movement was a lifetime away, it is merely two generations removed, and still very rooted for many Americans. Speaks recalls the terror that African-Americans lived under, in fear of the Ku Klux Klan and racist vigilante groups ready to violently harm perceived threats. Speaks’ “can-do” attitude has helped her shape a unique path. She shared her wisdom for young women seeking to forge their own path: “You need to do your research because there are many paths to pursue your dreams. But you have got to want it, and it won’t be easy, but I specifically talk to Black women when I say that it won’t be smooth as silk.” In the coming years, expect an autobiography from Almeta Speaks, who will bear the title “Doctor” in front of her name after defending her doctoral dissertation.